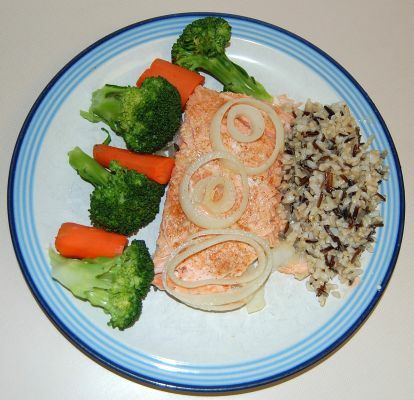 Salmon is a nutritious food that is high in protein and contains essential omega-3 fatty acids. 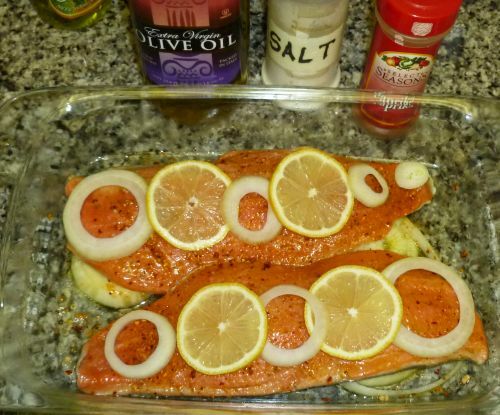 This recipe for baked salmon is delicious and easy to prepare. Place half of the onion rings on the bottom of a baking dish. Wash and dry the salmon fillets; place them on top of the onion rings. Squeeze the lemon over the fillets, and brush the olive oil on the fillets. Sprinkle the fish with paprika and salt. Place the remaining onion rings on top of the fillets. Bake in a 350°F oven for 20 minutes or until fish flakes easily. Serve with wild rice and steamed vegetables.